YANGON — Both the Myanmar government and military have condemned and complained about the Turkish deputy prime minister for his misinforming tweet on the massacre against the Rohingya Muslims in Rakhine State. On Aug. 29, Turkish Deputy Prime Minister Mehmet Simsek tweeted four photographs, urging the international community to stop the ethnic cleansing of Rohingya. His post was retweeted more than 1,600 times and liked by more than 1,200 readers. But it transpired the photographs were not related to the incidents in Rakhine. News on the recent conflict in Rakhine has been swamped by fake images and content condemning the actions of both Rohingya Muslim militants and the military. Tens of thousands of Muslims, Arakanese and Hindus have been displaced since the Arakan Rohingya Salvation Army (ARSA) attacked police stations on Aug. 25. However limited access for journalists to the region has made aspects of the conflict difficult to verify. 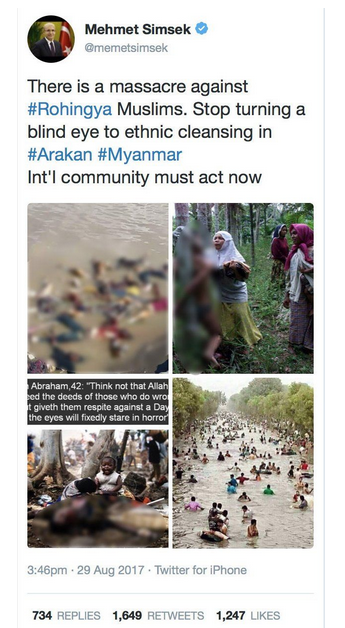 According to the BBC, a number of Myanmar people who have challenged Simsek about the tweet suggested the first photo was of victims of the devastating Cyclone Nargis in May 2008 or a riverboat accident in Myanmar. The second photograph showing a woman mourning a dead man tied to a tree was taken in the Indonesia province of Aceh in June 2003 by a Reuters photographer. The third photograph showing two infants crying over the body of their mother is from Rwanda in July 1994. The fourth picture, of people immersed in a canal, can be found on a website appealing for funds to help victims of recent flooding in Nepal. In a statement released on Sunday, the Myanmar Army stated Myanmar citizens were worried about the “terror attacks of ARSA extremist Bengali terrorists in Rakhine State,” using a term for the Rohingya to imply they are interlopers from Bangladesh. “The families of Tatmadaw (Army, Navy and Air) strongly condemn and object to the intentionally wrong expression of a State level official of a country,” read the statement. On the same day, the government’s Information Committee warned people not to share fake news on social media. It also added that the government summoned the Turkish ambassador over the tweet. “Despite the correction, the circulation of the fake news and pictures had negative impacts on Myanmar government, security forces and people,” it said. Meanwhile, on Saturday, the Turkish President Recep Tayyip Erdoğan accused Myanmar of “genocide” against Rohingya Muslims.